To keep track of 2017, we have designed this adorable but easy calendar project for you to create! 12x12 and 8x8 Craft Papers of your choice! 1. Begin by taking the back of your frame and cutting your chosen 12x12 paper sheet down to fit using Dovecraft’s paper trimmer. Adhere with Dovecraft Perma Fix Tape to your frame backing. 2. Download, print and cut out your free calendar templates. 3. Cut 12, 12cm x 10cm pieces of your chosen 8x8 paper. Using your Dovecraft PaperTrimmer, create a perforation line along the top of each vertical piece, approximately 1cm down from the top. 4. Adhere the calendar months to each piece of paper, in the centre, with Dovecraft Perma Fix Tape. 5. Add Dovecraft Perma Fix tape to the back of each piece of paper above the perforation line. Carefully adhere your months together. 6. Stick your finished calendar to the centre of your frame with glue. 7. Cut a 10cm x 3.5cm strip of complementing paper, adhere ‘2017’ to it using the Simply Creative Cork Alphabet and Number Stickers. Add this to the top left side of your frame with foam tape. 8. Leave a gap in the tape at the back to add a handy clip. 9. This will enable you to remove the clip with ease when you need it. 10. Stick a vertical line of Simply Creative pink gems to the bottom right hand side of your frame. What a gorgeous piece to have in your home, especially on your craft desk! 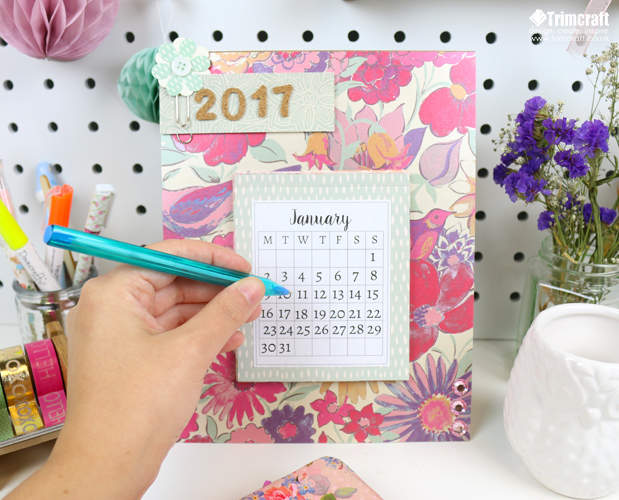 The perforated lines on each month, will help you take off each month with ease and keep track of the fast paced year too!